Twenty years ago the Clwyd-Powys Archaeological Trust compiled an assessment of the historic settlements of Montgomeryshire, on behalf of Cadw and the then Montgomeryshire District Council. It was one of several such assessments for the local authority areas of eastern Wales and ultimately ten reports were completed between 1992 and 1995, embracing the entire region for which CPAT had and retains a remit. In 2010 CPAT felt that the time had come to re-examine the pictures of its historic settlements, fifteen to twenty years on from when the initial studies were completed. 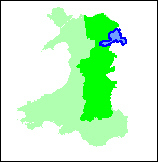 The former local authority areas of Brecknock Borough and Radnorshire were selected to initiate the programme in 2010-11, this has been followed with studies of Montgomeryshire and Flintshire in 2011-12 and for Wrexham and the Brecon Beacons National Park in 2012-13. Each of the settlements examined can be accessed by picking them from the map or the list below. The introductory text to the report can be reached by following this link. Pick a settlement from the list below. Each link will open a separate PDF, which may take a few seconds to load, and which can be read by Adobe Acrobat. If you do not have an up to date version of this program please click on the logo at the bottom of the screen to download one from the Adobe website.